The Blade was the first dedicated EPP 3D kit I saw anywhere. I very much wanted one, so I snapped it right up though it was a bit beyond my 30" wingspan preferred maximum. But they claimed a 7oz all-up weight, which I figured would turn out about 8oz, which would be just fine. Nope. I doubt it can be brought in at 8oz, and flies closer to 10 even without landing gear. But it still works. About 33-inch wingspan and roughly that long. I'm running a Nippy Black 0808/98 and a 9x3.8 APC SF prop with a 3-cell Thunderpower 730. Outstanding motor! But the kit stinks. They include feeble aluminum stiffeners and a horrid, heavy carbon-strap landing gear that flops around feebly. All the servo placements are completely wrong (and asinine). 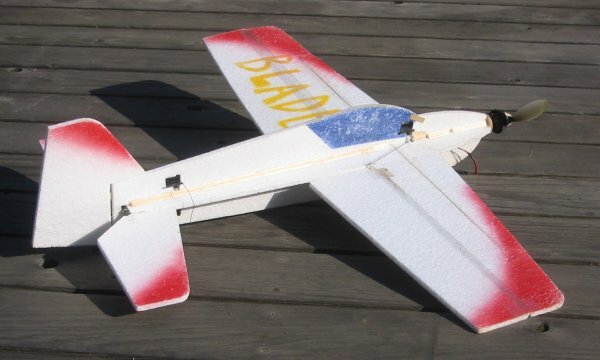 It's especially notable that the aileron servo counterbends as designed -- it should be rammed through the wing rather than stuck in the fuse under it. The motor mount is kind of silly, the control horns don't work, the elevator is hinged at 50% chord so it flaps like a flag ... argh! Don't get one unless you're planning on supplying your own carbon fiber, control horns, and want to redesign everything but the foam itself, which works great (you have to cut your own elevator channel, so move it forward). Ignore all instructions. At any rate, I was able to progress to a reasonable degree of high-alpha facility with this plane, which absorbed all the inevitable crashes with a fairly constant diet of canopy glue to stick the tears back together. Did I mention that canopy glue is the best way to stick EPP together? No? Try it. Has to set overnight and should be braced or taped together while drying, but you'll love the results. Oh, and don't try to tape hinges for the control surfaces. Use real mini-hinges or EZ Hinge and stick them in with canopy glue. Solves a problem that's been driving us all nuts!